Little by little it becomes clear that AMD may have another big winner in its hands after the Athlon and Athlon 64 processors, which debuted in years 1999 and 2003, respectively. Of course we are talking about AMD’s Zen processors and the upcoming AM4 platform. Here’s another hint – AMD’s future Summit Ridge processors, which will pack Zen cores, will be equipped with 8-core dies only. This will inevitably increase the cost of the processors but will allow AMD to offer a number of processors with different core counts just like the Phenom II generation a few years ago. AMD will now focus on offering mostly 8-core Summit Ridge processors, but if there are enough chips with defective cores, then 6-core and 4-core models may follow. The 4-core models may only be sold by OEM manufacturers only so there’s a chance that they will not be available in stores. Things are not the same for the Bristol Ridge generation, which will also use the AM4 platform. These chips will have one or two Excavator modules, hence 2 or 4 cores and will include AMD Radeon graphics with 512 stream processors on the GCN architecture. The chips will be announced along with AMD’s first Zen processors, which means that we should get them in H2 2016. AMD’s Zen processors are expected to perform very close to Intel’s fastest desktop processors. 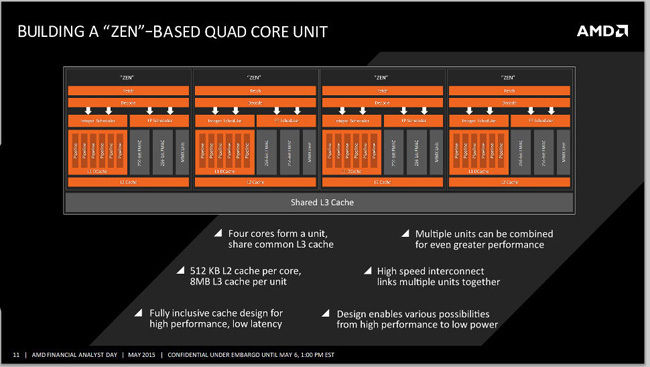 Zen is based on new four-core dies where each core has access to 512 KB of L2 cache and in addition to this each four-core die, called “unit”, contains 8 MB of L3 cache. Thus AMD can easily create processors with a varying number of cores in order to satisfy all market needs and niches. Moreover the units in all Zen processors will be connected via a high-speed bus. The performance should be there, don’t you think?